All these pans seem to stick, I even tried the Regis stone that says you can cook an egg without oil, They all stick after a few uses and the egg breaks as i try to remove it from the pan, or the pancake will not slide freely unless I use oil each time. Has anyone found a pan that is truly non stick? All these pans seem to stick, I even tried the Regis stone that says you …All these pans seem to stick, I even tried the Regis stone that says you can cook an egg without oil, They all stick after a few uses and the egg breaks as i try to remove it from the pan, or the pancake will not slide freely unless I use oil each time. 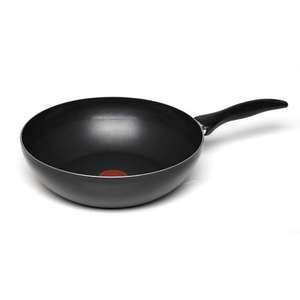 Has anyone found a pan that is truly non stick? I don't think you will eye.will. Although, saying that; have you tried those QVC type ones you see in Robert Dyas and The Range like places? Where there's a video playing with some American man saying "once you buy this, you'll never buy another pan again. It can cook, fry, steam, boil and even turn your wife on. You must buy this"
I haven't bought one myself, but interested in finding out if it can really turn my wife on! Bought one this morning in Wilko was actually a Tefal Precision Plus Pan . Shame Wilko is on the brink of folding........ nearest thing left like …Shame Wilko is on the brink of folding........ nearest thing left like Woolworths. Did not know that. Wilko is probably my favorite shop in town.